Dry pipe systems are installed in spaces in which the ambient temperature may be cold enough to freeze the water in a wet pipe system, rendering the system inoperable. Dry pipe systems are most often used in unheated buildings, in parking garages, in outside canopies attached to heated buildings (in which a wet pipe system would be provided), or in refrigerated coolers. Dry pipe systems are the second most common sprinkler system type. In regions using NFPA regulations, dry pipe systems cannot be installed unless the range of ambient temperatures reaches above 40F. Water is not present in the piping until the system operates. The piping is filled with air below the water supply pressure. To prevent the larger water supply pressure from forcing water into the piping, the design of the dry pipe valve, (a specialised type of check valve), results in a greater force on top of the check valve clapper. With the use of a larger valve clapper area exposed to the piping air pressure, as compared to the higher water pressure but smaller clapper surface area. When one or more of the automatic sprinklers is exposed for a sufficient time to a temperature at or above the temperature rating, it opens, allowing the air in the piping to vent from that sprinkler. Each sprinkler operates individually. As the air pressure in the piping drops, the pressure differential across the dry pipe valve changes, allowing water to enter the piping system. Water flow from sprinklers, needed to control the fire, is delayed until the air is vented from the sprinklers. 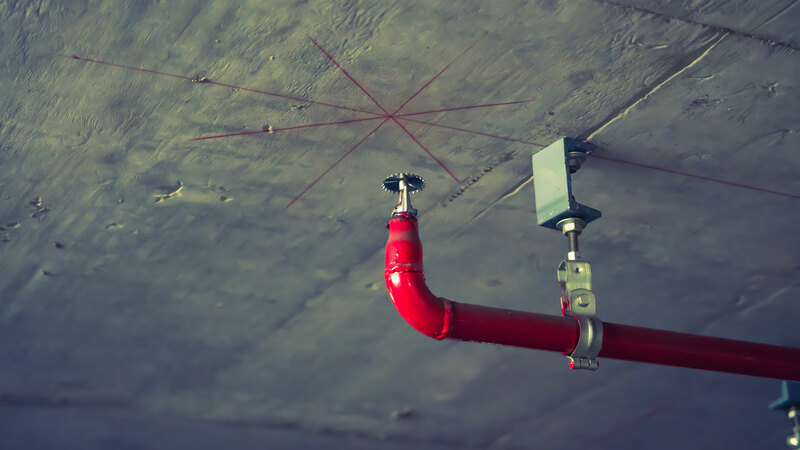 In regions using NFPA 13 regulations the time it takes water to reach the hydraulically remote sprinkler from the time that sprinkler is activated is limited to a maximum of 60 seconds. In industry practice, this is known as the ‘Maximum Time of Water Delivery.’ The maximum time of water delivery may be required to be reduced, depending on the hazard classification of the area protected by the sprinkler system. A check valve, clack valve, non-return valve or one-way valve is a valve that normally allows fluid (liquid or gas), to flow through it in only one direction.